Prasarana is extending the Ampang and Kelana Jaya light rail transit lines in Klang Valley, Malaysia. Construction works being undertaken at the LRT extension. CSR’s six-car light rail trains will run on the new extended lines. Syarikat Prasarana Negara Berhad (Prasarana) is currently extending the Ampang and Kelana Jaya lines, as part of the LRT line extension project in the Klang Valley of Malaysia. The two lines are expected to meet at an integrated station at Putra Heights, located approximately 25km from Putrajaya and 35km from Kuala Lumpur International Airport. The Environmental Impact Assessment of the LRT extension project was approved in 2009. Construction of the line extensions commenced in 2010 and is expected to be completed in the first quarter of 2016. RapidKL, a subsidiary of Prasarana, will operate the extension project being undertaken under the ‘Prasarana campaign of Bringing Transport Convenience Closer to the People’ programme. The construction cost is estimated to be RM7bn (approximately $2.1bn). The Kelana Jaya Line and Ampang lines are part of Kuala Lumpur’s light rail transit (LRT) network. The Kelana Jaya Line is a 29km LRT line running from the northeastern suburbs of Kuala Lumpur and Petaling Jaya to the west of Kuala Lumpur. The Ampang Line currently consists of two routes covering a distance of 27km. The existing Kelana Jaya and Ampang lines provide transportation for approximately 350,000 people. The two lines were integrated with a single ticketing system allowing the commuters to transfer from one line to another at Masjid Jamek station without buying a new ticket. The Ampang line extension will be 17.7km-long and will comprise of 13 new stations. It will be a standard gauge line starting from Sri Petaling Station and running through Kinrara, Puchong before reaching Putra Heights. It is expected to increase the ridership from the current 200,000 passengers to more than 400,000. "The Ampang line extension will be carried out in two stages with the first stage, comprising of four stations, expected to commence operations in October 2015." The Ampang line extension will be carried out in two stages with the first stage, comprising of four stations, expected to commence operations in October 2015. The second stage, which covers the remaining stations, will be operational by March 2016. The proposed Kelana Jaya Line extension will start from Lembah Subang Kelana Business Centre and pass through Subang, USJ and Alam Megah before reaching Putra Heights. Covering a distance of 17km, the new KJ line will comprise of 12 new stations. The new stations will be equipped with Universal Access facilities such as ramps, tactile tiles, low ticket counters and toilets for the disabled in addition to modern facilities such as lifts, escalators, public telephones and public toilets. The project has been divided into two main packages A and B. The package A of the Ampang line is from Seri Petaling Station to Station No. 5 covering a distance of 7.4km, while package B extends from Station No. 5 to Putra Heights Station covering 10.3km. The Kelana Jaya line will extend from Kelana Jaya station to Station 7 covering a distance of 9.2km under package A. The package B will be from Station 7 to Putra Heights Station with a distance of 7.8km. The major works, apart from the lines, will comprise of construction of stations, laying the segmental box girders, piling works, and earth works. The project construction process is divided into three components-advance works, facilities works, and system works. Advance works include relocation of the telecommunication cables, voltage transmission lines, sewerage pipes, and gas pipelines. Construction works will also include placing of 6,100 segmental box girders (SBGs) for the Ampang line, and 6,592 SBGs for the Kelana Jaya line. The LRT line, including the extensions, will employ 50 new six-car light rail trains supplied by CSR. Out of these, 30 trains will replace the existing trains on the Kelana Jaya line while the remaining 20 will run on the Ampang line. The first set is expected to be delivered in the fourth quarter of 2014. "The LRVs are equipped with articulated light railway technology that uses minimum turning radius." The light rail vehicles will offer a speed of 80km/h and accommodate up to 1,308 passengers. The LRVs are equipped with articulated light railway technology that uses minimum turning radius. It will also feature dynamic route display, CCTV and LCD infotainment screen. Trans Resources was awarded a contract worth RM950m (approximately $293m) for conducting the facilities works for the Kelana Jaya LRT line. UEM Builders and Intria Bina were awarded an RM93.2m (approximately $28.8m) worth sub-contract for the fabrication and delivery of segmental box girders. The joint venture (JV) of Bina Puri and Tim Sekata was awarded a contract worth RM634m (approximately $196m) for conducting the facilities works for the Ampang line. The JV was also awarded the subcontract for the fabrication and delivery of segmental box girders. 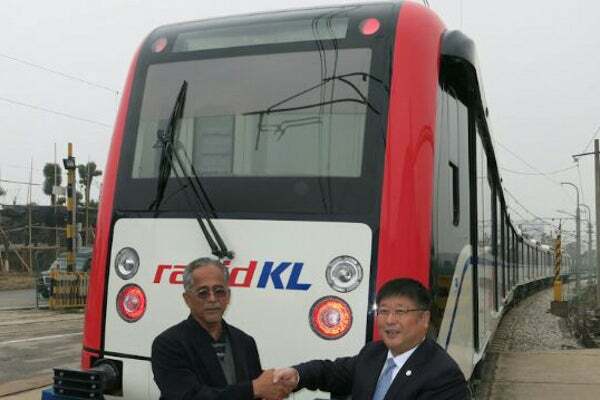 China’s CSR Zhuzhou Electric Locomotives will supply the six-car light rail vehicles for the Ampang line extension. The engineering, procurement and construction (EPC) contract for commissioning the system works for the Ampang line extension was awarded to the joint venture of George Kent and Lion Pacific. Huawei was contracted to provide the railway communication system for the project.